Some time ago I acquired an interesting bit of vintage tech, the Campbell Scientific C20 cassette interface. Since then it had been sitting on my bench looking lonely, I decided that I should at least try it out before I salvage any of the many useful chips it has inside. I have found a user manual for it along with information confirming that it is indeed what I thought it was, an interface for reading data encoded on audio cassettes by data loggers. Not having any audio cassettes with appropriately encoded data however created a very simple issue. How exactly should I get it to do anything at all? It turns out whilst the C20 is primarily designed for reading from tape, it is possible to get it to write one as well, I thought we might as well look at the encoding on my oscilloscope and record a sample of the audio. So I connected my oscilloscope to the output and a serial line to my old MS-DOS machine. After twiddling with the serial settings both on the machine and in Kermit I managed to get a welcome message and menu from the device which confirms that at least the CPU and serial lines are working. Unfortunately this is about as far as I have gotten. The manual is exceptionally useful, providing not only information about basic use, but also more detailed technical information and example programs in basic for operating the device. I’ve translated one of these programs for writing data to tape, it seems the device is receiving the data I’m sending, but nothing appears on the output that I can see. I’ve not worked out if it’s something as simple as not connecting the scope correctly or if there is some hardware failure. So unfortunately not as much to report as I’d like, but time has been quite limited and something is better than nothing. I’ll keep trying in the short term. 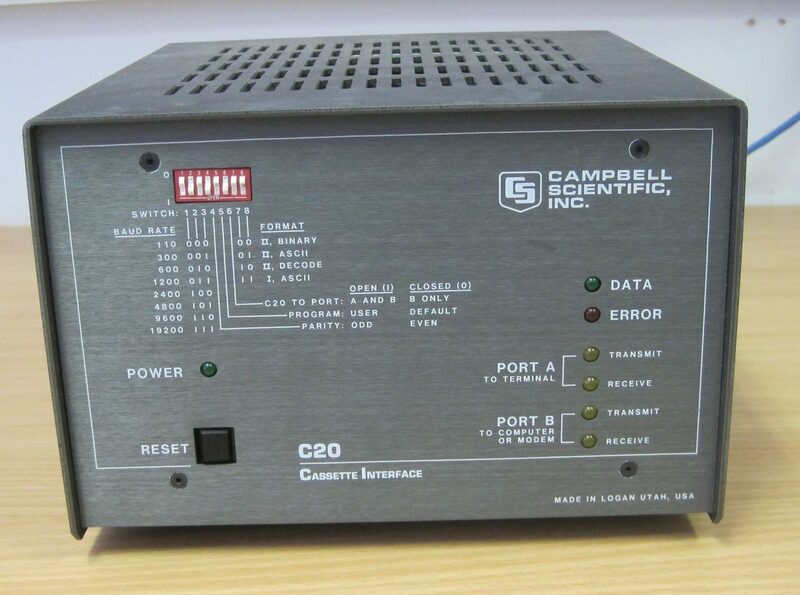 Today we’ve got something unusual, a RS-232 Cassette interface made by Campbell Scientific. They seem to have always been specialised in making data logger and acquisition system. I can’t be sure, but I think this device was used for storing digital data on audio cassette, a common media of the time. Micro computers of the time did this as well, but usually had this function built in. It’s likely that this would have been used with machines that didn’t have that capability natively, like a PC or perhaps some scientific equipment that can speak RS-232. 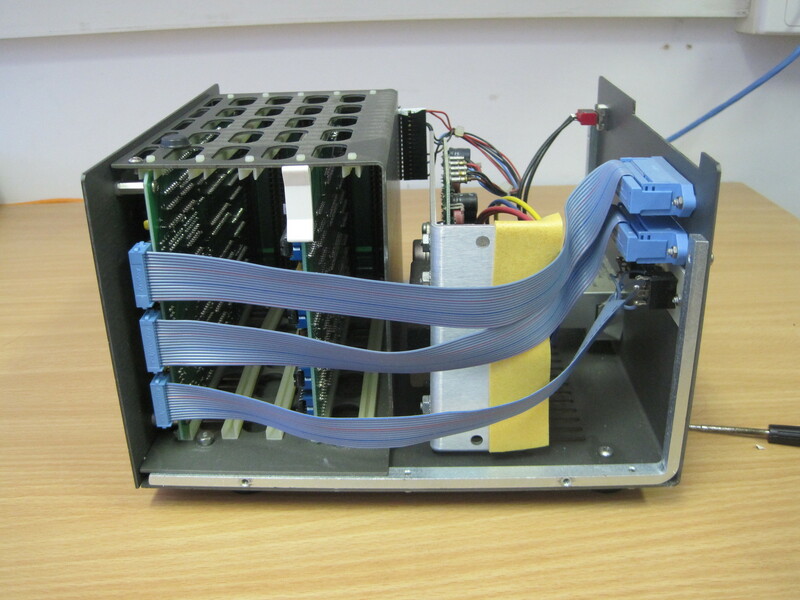 It’s built in a very sturdy and quite large metal enclosure. It feels very well made, the few switches on it (including the small DIP switches) feel like quality components that have held up quite well. The enclosure probably could have been smaller, but here you can see it probably wasn’t specific to this one device. The card cage only houses two cards here, but could have had 5 which would have been enough room for something more complicated. 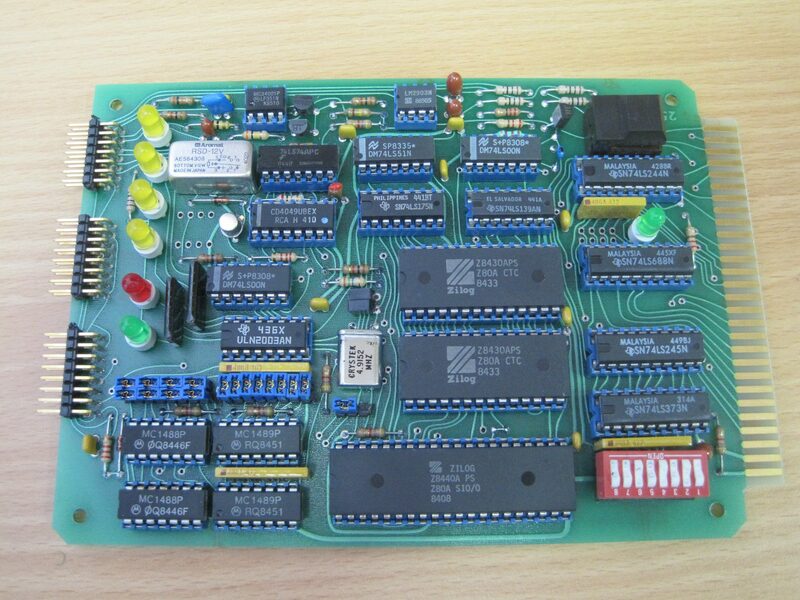 Here is the processor board, it has a Z80 CPU which would be running at 4Mhz. Around it are mostly simple logic chips in the 74 series, but directly bellow the CPU are two 2k word x 8bit SRAM chips as well as the EPROM. Interestingly the SRAM chips (CDM6116AE3) were used in the memory expansion socket on the MPF-1, I may be able to use one of these to expand my unit. Handily every chip is socketed, so repair (or salvage) is significantly easier. 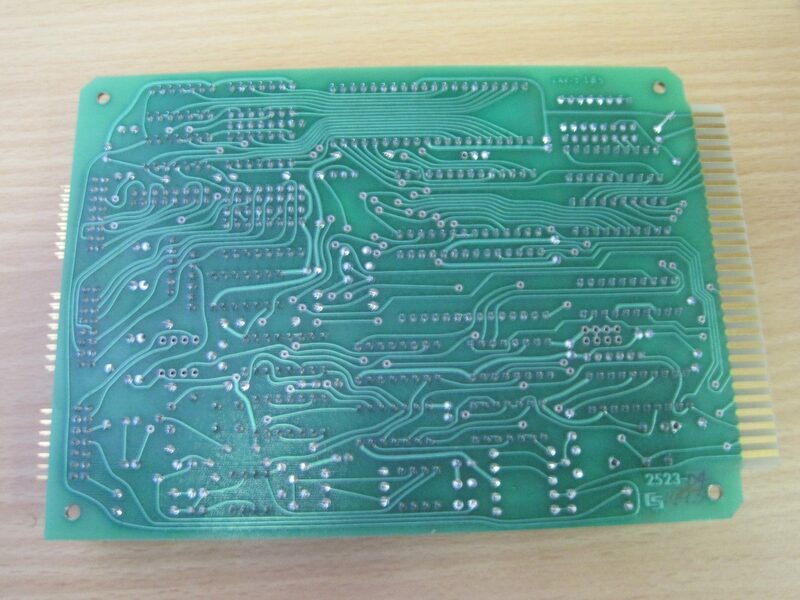 The board appears to have been designed by hand, as you can see many of the traces are quite curvy, it’s clear a great deal of care went into its design. 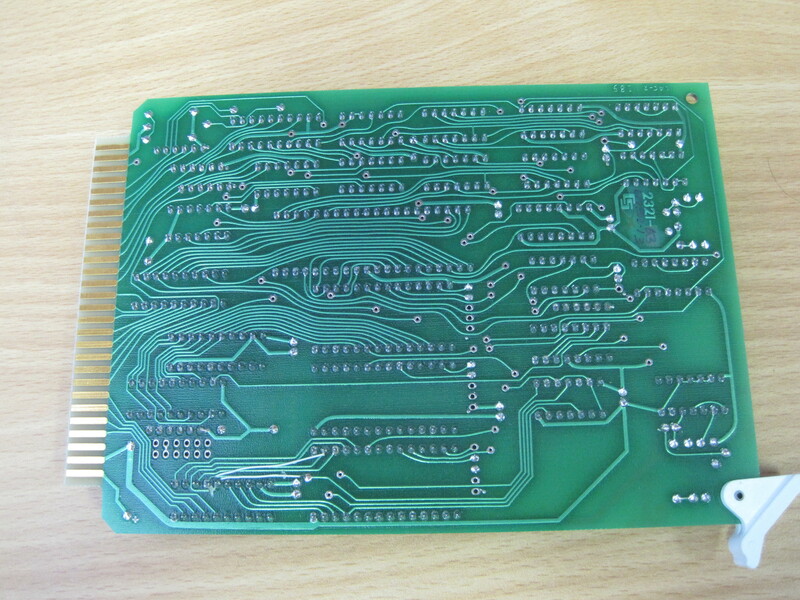 The front panel board has very similar construction, everything in sockets and hand designed PCB. All the input and output circuitry is on this board and includes a Z80 serial IO chip and two CTC (counter timer circuit) chips. Given that this is a tape interface there is a distinct lack of DAC or ADC chips, most of the smaller chips are 74 series logic, a couple of opamps and serial line drivers and receivers. I suppose other machines (like the ZX spectrum) didn’t have those chips for storing digital information on tape, so they probably use a similar technique. It does make it clear that analogue or audio data is not supported by this device. I’m a bit conflicted about what I’ll do with this particular device, the collector in me says keep it, but I don’t have a lot of space or use for it. 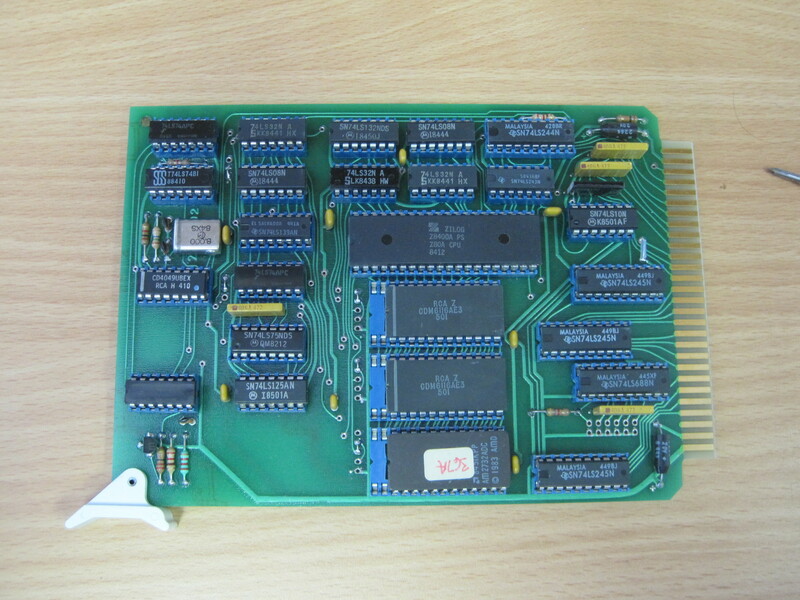 I may end up just keeping the boards for parts, as they are all fairly usable chips with data sheets available.